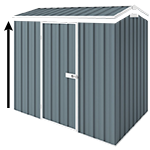 The only thing that this high quality Australian made shed is missing, is what you don’t need for a shed if you are placing it under eave right against a wall … the back wall. This size slimline storage unit is very popular among our customers with a smaller backyard when the garden shed need to go against the wall or the fence. Because this unit doesn’t have a rear wall, it saves you big time on materials and as a result on your wallet (or purse) as well and it also takes less time to assemble. So if you’re after a slimline shed that you want to put against the wall and you don’t need a back wall, then you can certainly save big on this one. Sheds comes in flat pack with wall anchors included. Product features 20 year warranty.